First class travel is a luxury if you can afford it, fantastic if you can manage an upgrade, and a major bonus if your employer pays the bill. No matter how you get there, the comforts and services are far better than what most travelers are acustomed to. Givenchy-designed sleeper suits, Bvlgari toiletry kits, and turn down service for your bed. These may sound like the services of a luxury hotel but they are, in fact, some of the comforts offered in Singapore Airlines' First Class. Space is what's most important to everyone who flies. Any business traveler can recite the seat pitch and widths for their favorite airlines because they are always trying to find a way to squeeze a couple of extra inches of comfort out of their flights. Space is certainly not an issue in this luxurious cabin on Singapore Airlines. Passengers will enjoy their flight from the comfort of their own Skysuite. Before you get all excited and start picturing your own hotel room in the sky, understand that the Skysuite is still just a seat in the First Class cabin. As airplane seats go, this one is pretty special. The Skysuite is upholstered in Connolly leather and trimmed with Burrwood. It can recline at any angle and become a fully flat bed. Perhaps the greatest feature of the Skysuite is the turn down service. When you are ready to sleep, fresh bed linen and a down-filled duvet will be laid out by the cabin crew, and you will be provided with a Givenchy-designed pajama suit and soft eye-shades. The inflight entertainment system (on Megatop 74s) comes with a 14 inch flat panel screen, one of the biggest in the sky. Since it would be s shame to have such a large screen with nothing to watch, First Class passengers can choose from a variety of entertainment options. 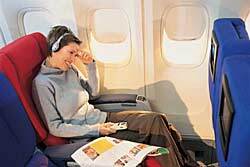 The onboard audio and video on demand system has over 25 movies, 50 short features, and 50 audio CDs. Each Skysuite also has laptop power supply source, adjustable lumbar support and reading lights. Food service offers all the luxury choices you would expect: Dom Perignon, premium chilled malossal caviar, chicken satay, Jamaican Blue Mountain coffee, and a selection of special teas. It is the flexibility of the food service that makes it great. Using the Singapore Airlines Book the Cook service, passengers can order their main course in advance. As long as you select your meal more than 24 hours prior to your flight departure, you can choose from an extensive menu. Kids can order from theYummy! kid's menu. Singapore Airlines' KrisWorld entertainment system is also a big draw for young travelers with its selection of 29 movies, 75 TV programs, music lbums, and Nintendo games. First and Raffles Class passengers can pre-order their meals up to 24 hours before flight departure from a special Yummy! kid's menu. Meal selections can be made online for tickets booked online, by telephone or fax. Yummy! service is available to passengers traveling on flights from Singapore, Amsterdam, Dubai, Frankfurt, Hong Kong, London, Los Angeles, Melbourne, Newark, New York, San Francisco, Sydney, Taipei and Tokyo. To break the record as the world’s longest non-stop commercial flight, Singapore Airlines has introduced the A345LeaderShip, an A340-500 ultra-long-range aircraft. The airplane flies from New York to Singapore in 18 hours. The A345LeaderShip was designed with the business traveler in mind - it has just 181 seats in a spacious two-class configuration. The seat measures 20 inches in width. If has a leather adjustable headrest and an innovative leg & foot rest. The seat has a nine inch personal video monitor. AC power supply outlets let you use your laptop in-flight. 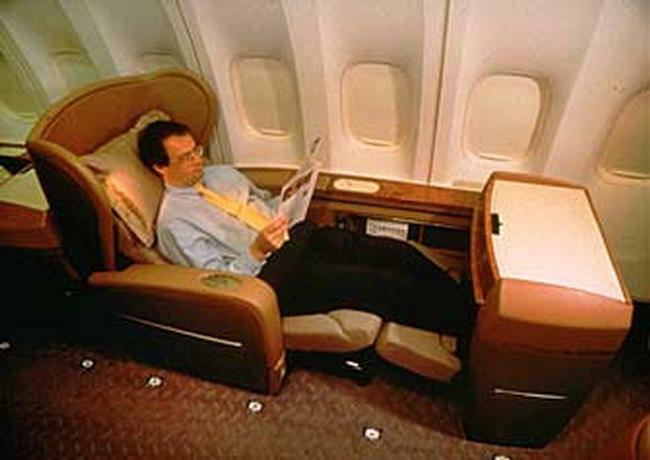 The Raffles (business) Class Cabin features 64 lie-flat SpaceBeds, arranged in a 2-2-2 configuration. Both Executive Economy Class and Raffles Class seats are equipped with the Singapore Airlines' in-flight entertainment system KrisWorld featuring 60 on-demand movies, over 75 TV programs and a many music, technology, travel and children’s programs. You'll be able to choose from over 100 music CD albums and more than 30 Nintendo games. The plane offers passenger corners in both Raffles and Executive Economy Class cabins where you can stretch out, chat with fellow passengers and enjoy a snack. The KrisFlyer rewards program offers several levels of membership - the more you fly, the more benefits you earn and the program is free to join. If you fill out your application online at www.singaporeair.com.sg, you can receive your number right away. You can earn miles with Singapore Airlines, SilkAir and any other program partners, including a number of hotels, car rental agencies, and other companies. Singapore Air is a member of the Star Alliance, so you can earn miles on a number of carriers, including Austrian, Lufthansa, Air Canada, United, US Airways, and others. Hotel partners include Hilton, W Hotels, Hyatt, Raffles, Marriott, Westin, and many other chains. A complete list can be found at www.singaporeair.com.sg. Miles can be redeemed for free flights and upgrades on Star Alliance partners. If you accumulate 25,000 credited flight miles in any class of service in a 12-month period, between 1 April and 31 March each year, you will become a KrisFlyer Elite Silver member. Benefits include a 25% bonus on actual miles flown and priority when waitlisted. You can reach a Gold member status if you accumulate 50,000 credited flight miles in a 12-month period, between 1 April and 31 March each year. Benefits include increased check-in baggage allowance, priority check-in and boarding, and worldwide lounge access. o qualify for PPS Club membership, you need to earn 50,000 credited flight miles or 25 flight sectors in First or Raffles Class on Singapore Airlines, or Business Class on SilkAir, within 12 consecutive months. 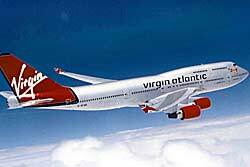 Many membership benefits are also valid on Star Alliance flights, Virgin Atlantic and SilkAir. For details, see the KrisFlyer section on the airlines' web site. Sign up online at www.singaporeair.com.sg if you want to receive a membership number right away, or pick up an application next time you fly Singapore Airlines.